It is still in the production and preorder stages, but, judging from a released video of the $69 iPhone 4 LifeProof case taken to the beach, it looks very promising. LifeProof, which is based in San Diego (hence the beach test:), claims that this is the thinnest iPhone case to comply to the full military IP-68 protection standard. It adds just sixteeenth of an inch (1.5mm) to Apple's finest waistline, but manages to keep your iPhone 4 underwater up to 6.6 feet (2 meters) fully functional for half an hour. Plus, the whole case weighs just an ounce. Double-coated optical glass lenses ensure clear pics and video, and, of course, you can just wipe the protective glass above the screen from water, and you are good to go. If you have waterproof headphones, LifeProof will sell you an adapter for plugging them in, for those times you just feel like surfing with the music blasting from your iPhone 4. Or, alternatively, you can just use a few-dollar splash bag for your underwater encounters. In addition, you can drop it from up to the same height - 6.6 feet (2 meters) - then just grab it and go. 26 tests have been made with all of the iPhone 4's edges and surfaces meeting the concrete, as is the IP-68 certification testing procedure. 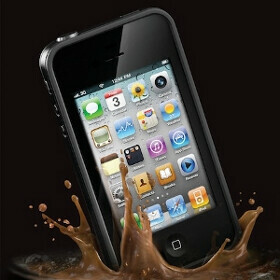 A number of applications come to mind for the LifeProof iPhone 4 case, but this one is still to hit the shelves, so until we see the finished product put to the test, we will spare judgment. I would consider something like this. What make it stop sinkin after 6.6 feet? Why you need a phone in the ocean? your an idiot. go get a life. in pakistan 3gs 16gb black is available for 500 usd...!!! and iphone 4 more then 816 usd 16 gb....!! what the hell...!! Does anyone know when this case comes out?? I bought case and tested as recommend. My took in a lot of water I will be contacting life proof to see how well they take care of issue.